Build a compact computer system that runs on an AMD processor with the A320M Grenade AM4 Micro-ATX Motherboard from MSI. The A320M Grenade comes armed with an AMD A320 chipset and AM4 socket to support AMD's series of RYZEN along with 7th-generation A and Athlon processors. With a micro-ATX form factor, the motherboard provides two DDR4 memory slots as well as one PCIe 3.0 x16 slot and two PCIe 2.0 x1 slots. There's also a set of LEDs built into the back of the motherboard to deliver a red glow inside your case. The MSI A320M Grenade comes equipped with four SATA connectors that allow optical drives, hard drives, and SSDs to be installed. To enable fast access to data and quick boot up times, an M.2 slot is also available, so you can install a SATA- or PCIe-based M.2 SSD. Aside from storage, the motherboard has two USB 2.0 and four USB 3.0 ports. For multimedia connectivity, it comes equipped with HDMI, DVI-D, and VGA video outputs as well as three audio jacks powered by a Realtek ALC887 processor. Additionally, a Gigabit Ethernet port is on board to provide a reliable wired Internet connection. AM4 chipsets provide dedicated PCIe lanes for USB, graphics, data, and other I/O. Customize and set up your own color scheme with RGB Mystic Light Sync. You can select any of the colors from the palette using the MSI Gaming app for smartphones and desktops to match your personal style. 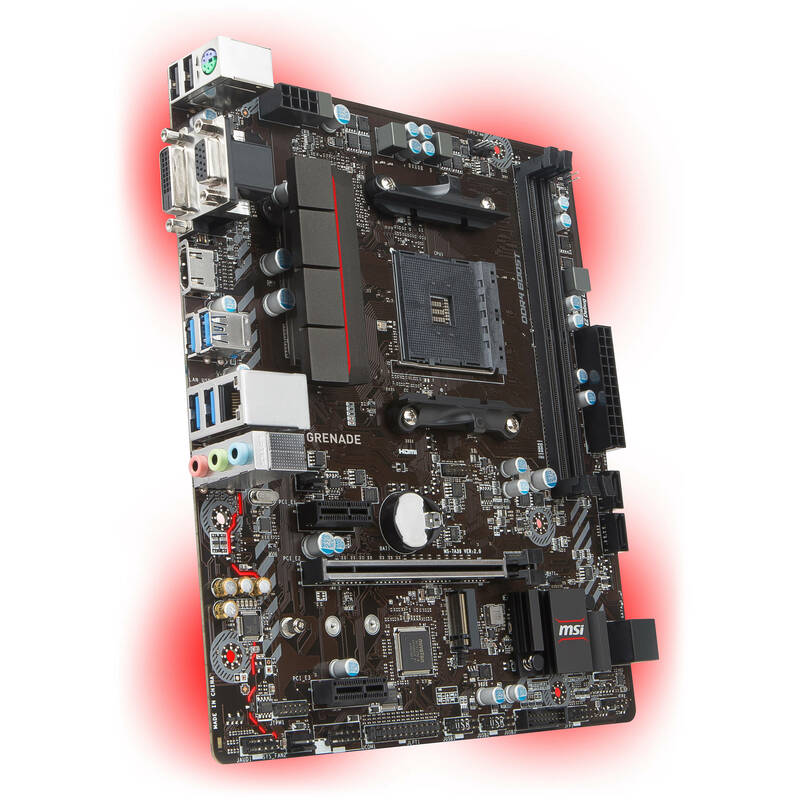 This motherboard features LEDs on the back to create a red glow inside your case. For additional lighting inside, a Mystic Light extension header is on board for controlling optional RGB strips, fans, and other gear, without needing a separate RGB controller. Additionally, Mystic Light Sync can also work with select LED-enabled keyboards and mice. MSI fan headers automatically detect fans running in DC or PWM mode for optimal tuning of fan speeds and quietness. To ensure your system stays silent, Hysteresis is also available to make your fans spin up fluently. Total Fan Control software is offered so you can take control of your fans and check the system's characteristics in a simplified graphical interface. You can also set up to 4 temperature targets for the CPU and motherboard, which will adjust the fan's speeds automatically. With premium audio components, this motherboard offers studio grade sound by offering separated audio layers and Chemi-Con audio capacitors as well as an isolated audio design, De-Pop protection, and EMI-shielded HD audio processor.